The minds behind Beyond the Score seem to be getting into the swing of things. 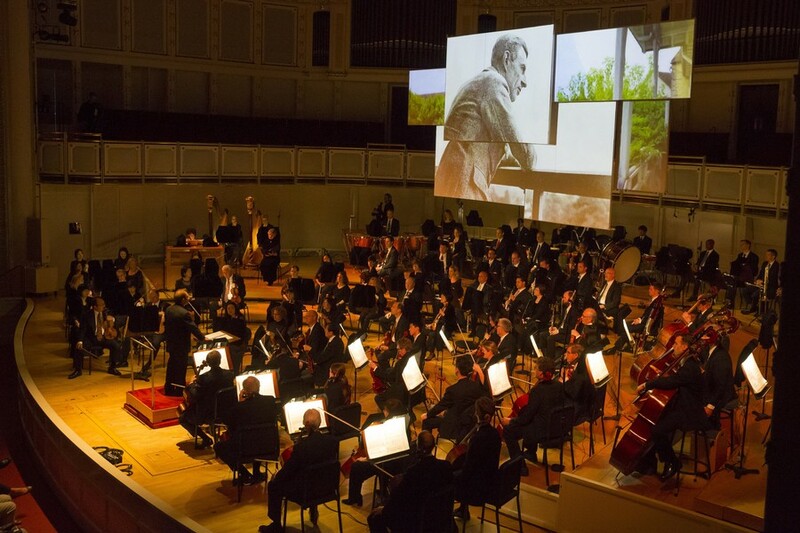 Ten years have passed since the premiere of the Chicago Symphony Orchestra’s educational multimedia series, which has since seen productions both good and, frankly, goofy. The driving concept is a brilliant one: Through dynamic projections and narration, Beyond the Score contextualizes standard repertory pieces, drawing from composers’ private correspondences and other primary sources while the orchestra plays musical excerpts. However, installments in previous seasons were sometimes melodramatic and directionless, feeling less like a cogent presentation and more like a flurry of quotes, declaimed by an overwrought actor and punctuated by musical interludes. If anything, Beyond the Score has demonstrated that it does best when it eschews overindulgence, sticks to the point, and more or less lets the music speak for itself—which is exactly what June 5’s “Ravel: A Portrait” did. The narrative is framed around a trip through Le Belvédère, Ravel’s house some 30 kilometers outside Paris. Upon entering the home, guests are astonished by the curiosities there: Knickknacks upon knickknacks crowd every shelf, nook, and cranny. “Ravel never came back from a trip without bringing back something hideous,” recalls one of the recorded voiceovers, almost wistfully. But these small objets d’art are more than just souvenirs. As Beyond the Score creative director Gerard McBurney noted, “the objects are his music”: Grecian urns and figurines recall the idyllic soundscapes of Daphnis et Chloé, pictures of 19th-century Spain the driving rhythms of Rapsodie espagnole, and Japanese woodcuts the magnificence of “Princess of the Pagodas.” The production leads us through the house like a museum tour, stopping to examine an artifact as its musical equivalent plays. The musical excerpts were well-selected and topical: For example, snippets of Ravel’s jazzy Piano Concerto in G were played to represent Ravel’s visit to America, where he met George Gershwin (and apparently picked up a gaudy miniature of the Statue of Liberty for his mantelpiece). Quite a few excerpts were taken from his opera L’enfant et les sortilèges and ballet Daphnis et Chloé, though the latter was perhaps given slightly too much attention in the production. “Ravel: A Portrait” also takes the prize for the most aesthetically pleasing Beyond the Score to date. At the end of “Portrait,” Ravel leads his guests to the grand finale of their tour and his “greatest creation”: his garden. As though Ravel himself had flung open the back door, the stage was suffused in warm, golden light to the rousing final bars of Mother Goose’s “The Fairy Garden,” adding another dimension to the greenery projected on the screen above. Even the projection screen itself was a devoted touch, geometrically assembled to recall the abstract art popular in Ravel’s day. In a post-concert Q&A, McBurney expressed amazement at Le Belvésdère’s timelessness. With just a few exceptions, everything in Ravel’s house is just as he left it, “like he’d walked out of it the moment before you got there.” And that’s precisely what “Ravel: A Portrait” succeeded at doing: bringing Ravel to life so vividly that audiences felt as though they themselves had enjoyed a near-encounter. Though Ravel stepped out of Le Belvésdère for good in December 1937—the month he died on the operating table in a Paris hospital—after “Ravel: A Portrait,” one could not help but feel his absence anew. Beyond the Score continues next season with presentations on the music of Bernstein, Janáček, and Falla. See cso.org for event details.